Google’s annual fall hardware event took place last week (Oct 9th) in New York, with the company unveiling its new phone and some intriguing new devices. Perhaps not as jam-packed with gadgets as you might expect from an event of its size, Google still provided fans with a line-up that’s sure to get people preordering. In fact, these preorders went live even before the event finished! Before the event happened, the Pixel 3 and its 3 XL companion were leaked to onto the internet. Of course, when these leaks occur, you have to take them with a pinch of salt. In the case of the Pixel 3, though, the reports were pretty much on point. 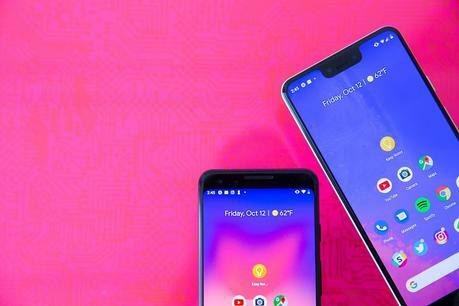 The Pixel 3 is a 5.5-inch smartphone, while the 3 XL is slightly larger at 6.3-inches. The main pull for both smartphones, though, is the fact that the Pixel boasts some serious camera features, making it perfect for selfie lovers and amateur photographers alike. Oddly, the Pixel 3 and 3 XL don’t have two rear cameras, instead the front camera has a dual lens for wide angled selfies. This will be particularly useful for large group shots. As well as dual front-facing cameras, the smartphones will also have night sight low light mode, high-resolution zoom and a Photobooth mode that can automatically take pictures of pets or people. There will also be a feature called Top Shot that will capture a number of pictures before and after you press the shutter, the AI will then pick out what it thinks is your best photo. All of these camera extras will be branded under the “Pixel Visual Core” chip. Not a lot was mentioned about what Android Pie will bring to the Pixel, bar the fact there will be a new silence mode. This mode allows you to place your phone front face down on a surface to automatically silence all of your notifications. A mode that will definitely be useful for during work or class. Preorders to the Pixel 3 and 3 XL are live now, with the phone shipping on October 18th. The 3 will retail at $799 and the 3 XL at $899 for a 64GB handset. The smartphones will also come with six months of YouTube music for free. You can also get a wireless charging Pixel stand for $79 that will prop your phone up to be a standing Google assistant while charging. The Facebook Portal was announced this week amid concerns from consumers who were reluctant to invite a Facebook-brand camera and microphone into their homes, and now Google has launched its own similar smart display that may just swing consumers away from the Portal. Of course, The Home Hub lacks a camera, so it’s not really a direct competitor for those looking to video calls. However, camera aside, the Home Hub is otherwise very similar to the Facebook Portal and Amazon Echo Show. It will integrate with your Google Photos, turning its screen into a digital picture frame, as well as your other smart devices so it can display appointments and upcoming events. It also has Voice Match to recognize who it is talking to and what they might need and has full YouTube integration for streaming videos. For peace and quiet during meal times, you can set up designated quiet times when the hub will not send you any notifications – a brilliant feature for those trying to implement some gadget-free times. The Home Hub is available for $149 with six free months of YouTube premium and will be shipped from October 22nd. 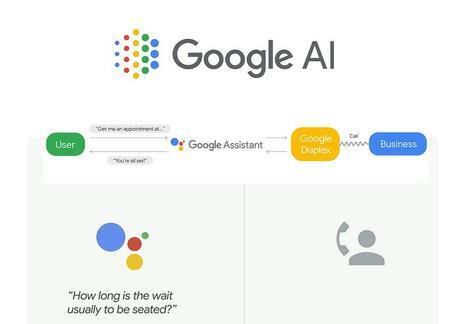 The idea of an AI voice calling system has been the center of controversial debate ever since it was announced at Google’s I/O developer conference earlier this year. Do we really want our phones to be able to phone salons for appointments or restaurants for reservations? Well, for many of us that loathe conversing with others on the phone, the news could be fantastic. Although, with online booking prevalent in the industry, AI calling doesn’t feel incredibly necessary. Duplex will be available exclusively to Pixel owners and will be rolled out starting in November on a city-by-city basis. Perhaps more interesting is the spam call-screening feature that the Pixel 3 will benefit from. This will screen your phone calls to look for suspicious or spam calls and advise you whether to block or return the call. 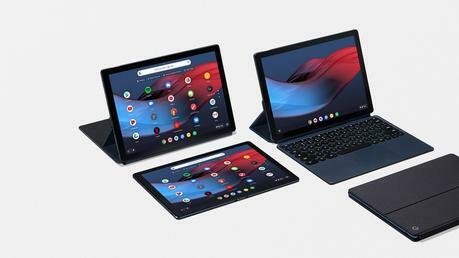 The Pixel Slate is a new detachable Chrome OS tablet. Available in navy blue only, the Slate has a 12.3-inch display, dual speakers on the front, rear and front 8MP cameras and fingerprint recognition for fast unlocking. There is no headphone jack, though. At launch, a compatible Bluetooth Pixel Slate keyboard was announced. This will come with backlighting and rounded keys, but will not be included with the tablet. Instead, it will be sold separately for $199. You can also purchase a compatible stylus for $99. The Pixel Slate does not yet a release date yet and may be delayed as late as next year due to it still awaiting approval from the FCC. When it does get released, expect the Pixel Slate to retail from $599.